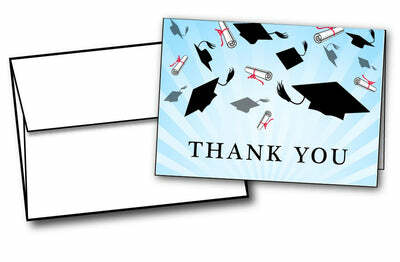 Graduation Caps Thank You Cards by Desktop Publishing Supplies are perfect for sending to friends and family to thank them after attending your graduation and/or graduation party. These Graduation Cap Thank You Cards feature Caps & diplomas over a blue sunburst background. Graduation Cap Thank You Cards are made from a 65lb cover cardstock and are packaged flat so you can print on them with your home printer. These cards measure the standard thank you card size of 4 7/8" x 3 3/8" when folded. A matching amount of white gummed square flap envelopes are included!